Akrotiri Residences: Our Priority is for Good Life! Let your eyes linger over the Tinos harbour. Enjoy the calm. Gaze at the Cyclades. 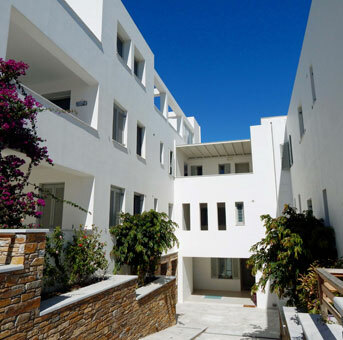 In Passakrotiri, overlooking Tinos harbour , in a standalone plot of 3750 sq.m., the Akrotiri residences stand looking to the most cherished island of the Aegean Sea, offering uninterrupted views to the port, the rock of Exobourgo, the Church of the Blessed Virgin Mary, the villages of the Tinos Municipality, the Monastery, the Vrekastro peninsula, and the Agios Fokas beach. In the horizon, you can see the Cyclades: Syros, Mykonos, Delos, Paros, Naxos... there is no place for worries in this land! Forget the city and its bustling roads, jammed with cars: only five minutes away on foot, a unique beach is waiting for you. With its three-kilometre stretch of fine sand, the beach at Agios Fokas invites you for a swim, a bicycle ride, a stroll... and, should you wish for shops, restaurants and nightlife, you can reach downtown Tinos on foot again! Built on the perimeter of the plot, one single- and four two-storey buildings form the sides of a large garden filled with the scents and colours of the Mediterranean. Shady arcades give access to each one of the four streets enclosing the plot. Lifts take you to your residence, and ramps make life easier for ... mums, as well as for the mobility impaired. And, of course, the careful energy design of the complex ensures economy and respect for the environment, while meeting all requirements for energy certification. Residences from 70 to 160 sq.m., to accommodate both your family and your guests. One parking place and one storage room in the spacious basement, are provided for each residence. Coolant and drainage networks for VRV air-conditioning. Telephone, DATA and ADSL lines. Central antenna for conventional and satellite television reception. 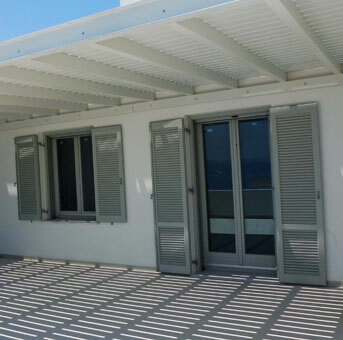 Roof slabs made with KNAUF’s BETOBOARD X-Therm system. OIKOBLOK bricks, which also have exceptional structural characteristics, on the outside masonry. Entrance doors, shutters and window frames made from tropical wood, with double-glass energy glazing. Wiring for installing ceiling fans in the bedrooms. Hot water from solar heating panels. In Akrotiri you needn’t worry about a thing: a permanent caretaker and a gardener look after our permanent residents and holiday-makers, ensuring the smooth operation and cleanliness of the complex, and tending and maintaining the gardens. Leave your worries behind. Come to Akrotiri. 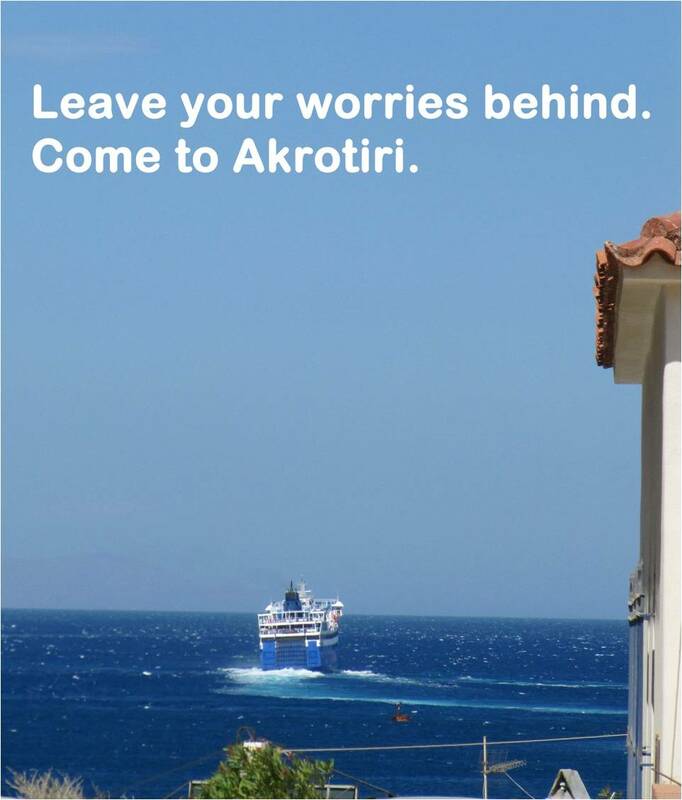 Leave your worries behind and come to Akrotiri. Come home. If you choose to contact us now, not only will you be able to choose the view that you will be seeing from your window every morning, but you will also have the opportunity to add yourself the final touches that will make your house uniquely yours: choose colours and materials, textures and arrangements, and create the perfect home – your own.